New innovations in dentistry make it possible to preserve natural teeth for longer. Unfortunately, 35 million Americans do not have any remaining natural teeth despite these advancements. If you are among those who have an incomplete smile, your quality of life has significantly declined. Now, you can no longer smile with confidence, eat your favorite foods, or speak clearly. You do not need to live with the challenges. Your dentist in Marlton, Dr. Kristin B. Petulla and Dr. Jennifer L. Kazemi, have the solutions you need with partials or dentures. Every tooth is vital to your oral health and functions. When living with tooth loss, eating becomes increasingly difficult. As a result, you may have to limit your diet. This can lead to nutritional deficiencies that impact your health. Your teeth also allow you to speak clearly while also providing your facial structures with support. When you lose them, you may suffer from low self-esteem and avoid certain social situations because you are too embarrassed about your slurred speech or your appearance. Provide your facial structures with support. There are several types of dentures in Marlton to replace your missing teeth. After performing an initial consultation, we create a customized treatment plan to rebuild your smile. Depending on your degree of tooth loss and your preferences, we find the best solution to meet your needs. If you still have a few healthy teeth remaining, a partial denture will fill the empty spaces. Prosthetic teeth are crafted to match the size, shape, and color of your natural ones, which are featured in a gum-colored base. 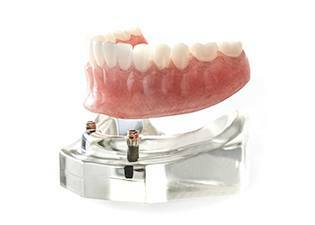 The denture has a metal framework to allow it to clip or clasp onto your teeth to hold it in place. 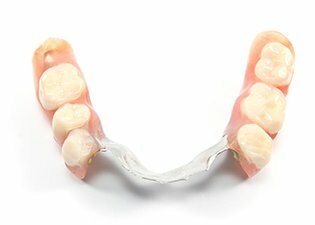 An entire arch is replaced with a full denture. We take an impression of your mouth to create a comfortable base for your denture to hold your new teeth. The denture is held in place using suction or an adhesive to prevent any slipping or irritation. You can enjoy the next best thing to your natural teeth with implant-retained dentures. An average of 4 implant posts is placed into your jawbone to secure your denture. With the right care, it has the potential to last for a lifetime. There are several factors that influence the amount you can expect to pay, such as how many teeth you need to replace, the materials that are used, and if you need additional procedures. We help you maximize your dental insurance to reduce the amount you need to pay out-of-pocket. We accept a variety of payment options, including CareCredit, to keep your new smile affordable. You can overcome the challenges of tooth loss with the right denture. Contact our office today to schedule a consultation.